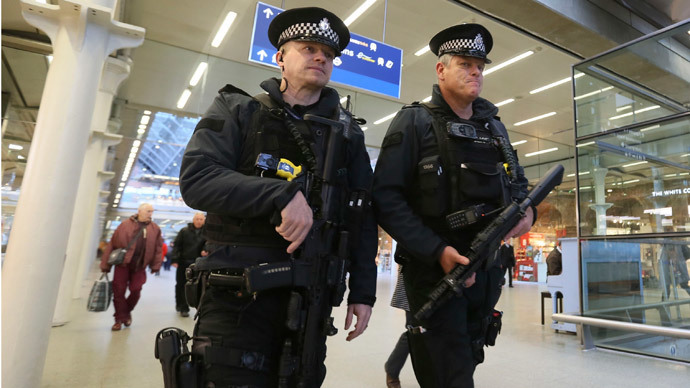 Senior British police officers have voiced concerns at the current levels of funding after it was revealed that a suspected terrorist is arrested every day in connection with Islamic extremism. Metropolitan Assistant Commissioner Mark Rowley said the growing threat from returning fighters who have joined the Islamic State (IS, formerly ISIS/ISIL) meant that extremists were being detained on a near daily basis, with attacks from “misfits and criminals” feared. Speaking on the BBC’s Andrew Marr Show, Rowley said he had requested extra funding from the government, claiming “vulnerable” people were being targeted by terror organizations to commit atrocities in the UK. Rowley further revealed that 600 British citizens have traveled to Iraq or Syria to join the conflict, of which nearly half have returned. “We are not just dealing with a classic terrorist organization, organizing plots across the world. We are dealing with a group trying to create a corrupt cult of people, of followers who will act in their name,” he said. He said it was individuals acting of their own accord who posed the greatest threat to national security. The police are now taking down 1,000 web pages containing extremist material every week. Prime Minister David Cameron previously said, in the wake of the shooting at the Paris offices of satirical magazine Charlie Hebdo, a similar attack was likely to happen in the UK. His sentiment was backed up by the Director General of MI5, Andrew Parker, who said last month a terror attack in Britain was almost inevitable because the security agencies couldn’t foil each individual plot. The latest figures show the number of people arrested for terrorism charges has risen by a third since 2013, to a total of 327. Some 165 people were arrested in relation to Syria, which showed a six-fold increase from 25 in 2013. He said there were “indications” that the anti-terror unit would expand over the next year, and that emergency plans to deal with terror attacks had changed following the Paris shootings. “In terms of our national firearms capability, we've asked is it strong enough? How's it placed? How's it organized?” he said.